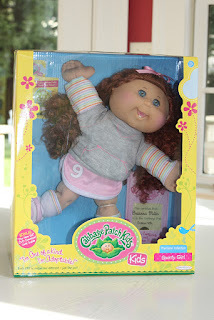 The Grandma Chronicles: A New Cabbage Patch Updated Doll and Giveaway!!! 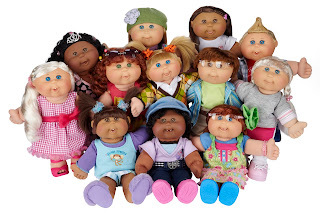 If you had girls in your life thirty years ago you remember Cabbage Patch dolls. They were a must have doll. You “adopted” the doll and each came with her own name. You could buy Cabbage Patch doll clothes and accessories. Little girls would walk their Cabbage Patch dolls in strollers like little mothers themselves. Grown women fell in love with them and collected them. Grandmas sewed up fancy outfits for them. It was more than all the craze - it was a phenomenon. I can see you smiling and remembering your own story. Well, Cabbage Patch kids are back, updated and cuter than ever. This Fashionista collection are not baby dolls and they each have a theme. There’s Girly Girl, Sporty Girl, Preppy Girl, Artsy Girl and more. There are a total of 12 dolls in the collection including two boys and multicultural choices. Of course, each has a name just like the original. Mine is Brianna Mika. The doll comes with a birth certificate and adoption papers creating the same feel of uniqueness that the original doll did. There also is a code and instructions to download a build a family tree program for your doll. Here’s my Cabbage Doll story – a little different than most. My daughter was in third grade when they were on almost every girl’s holiday gift list. I emphasize almost. Fran, my daughter, frequently marched to another drummer. Every store was sold out. Some specialty stores bought new ones from individuals and sold them for 2 -3 times the sticker price. I was lucky. I wasn’t one of those frantic mothers desperately seeking a Cabbage Patch doll. But as Christmas approached, I became worried that Fran would want one at the last minute and I would have no chance at getting one. It was so much easier the year before when she wanted Rainbow Brite. I put my name on a waiting list at ToysRUs. My number was three hundred something. Fortunately, Christmas came and no request. Now I was worried that once vacation ended and she saw that everyone had one then she would have to have the Cabbage Patch doll. ToysRUs to the rescue! Several days after Christmas they called and had them in. I had 24 hours to pick it up or they would move down the waiting list. $29.95. List price. Available now and no mark up. I bought the doll and put it in the attic waiting to have it when she asked. She never did. The following year I donated it for the silent auction at the school fundraiser and it was gobbled up quickly. I love toys that bring back memories. When you give a child a gift like a Cabbage Patch doll you also have the opportunity to share your stories and build bonds across generations. Watching children play with something that brings back memories is enjoyable for grandparents too. The Cabbage Patch Doll is made by Jakks Pacific and the retail price is $34.99. 1. Leave a comment here on my blog. Deadline to enter: October 13, 2011. The winner will be selected using random.org. Make sure to to check back to see if you won – I’ll need your address if you won. Or you can send me your email address when you enter – marionconway@aol.com. It will remain confidential. Full Disclosure: I received a sample Cabbage Patch Doll for review purposes. This review is completely my own opinion. If you are a fan of dolls, you may be interested in my review of a new line of sports oriented rag dolls. We took our daughter to the CPK Babyland General about a year ago. She was just about to turn two, and I wanted her to see and love on these adorable dolls. We ended up buying her her first doll there, a $20 bald baby that she lovingly named Ting Ting, after her aunt Ping Ping :) I just love these dolls and the memories they inspire. I'd love one of these for my daughter! I had 5 Cabbage Patch Dolls when I was a child and I loved them. These bring back memories. I like Cabbage Patch Kids on FB with my username Mary Happymommy. My children were past doll age when the Cabbage Patch craze hit, but I remember my sister searching madly for one--and finding it! I liked JAKKStoys on Twitter. I'm "grandparent." sorry if this post twice, I am not sure if it went through the first time. I always wanted cabbage patch dolls but we couldn't afford them when I was younger. I would love to have one of these to give to my family. I am raising 4 grandchildren now (not her kids- but the older sisters kids). 2 are girls, they would love to have a Cabbage Patch doll... and they love those stories, so I would def. share the story as well. 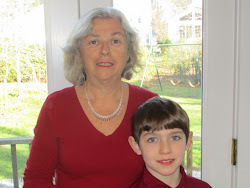 I liked CPK Toys on Facebook, follow Jakks on Twitter and the Grandma Chronicles on Facebook. 30 years ago, my two sons were 1 and 2 years old...thought I was off the hook when Cabbage Patch dolls came out, they were in to trucks and planes. But, no such luck, my girlfriend, 3000 miles away, called to tell me her 2 year old daughter would be sooooo disappointed if she couldn't have one for the holidays and my friend had searched all over NY for one. Could I please start searching in so. California for her? I did...Toys R Us, all the local toy stores, everything...I felt so bad I couldn't find one....until: I walked in to my local independent CARD STORE!!! !...and there she was: the Cabbage Doll! Was she Beautiful? To me, she was! I bought her right away, and sent her off to my girlfriend in NY...in time for the holidays. Thirty years later, we're still friends, we still talk about the "Cabbage Patch Caper". Now, I have two granddaughters of my own and my girlfriend is expecting her first grandson. My turn! I'd love to win one of these dolls! Thanks for such a great giveaway! My daughter would love a cabbage patch doll, they were a firm favorite for me as a child a lot of happy memories...gr8 toy! Hi, i am a new follower of your blog. I bought a CPK at a bootfair today which is from 2004 and i am smitten with her. I was born too early for them when they came out in the 80's so am making up for lost time now.